We’ve had a bottle of cava ‘chilling’ for months now and we still haven’t popped it to celebrate our book deal. Anyone would think it was a bottle of Krug Clos du Mesnil 1995 Champagne ($750 per bottle) which might go some way to explaining the dithering. But no, this is a bottle of Valle de Juy Cava; €2.30 a bottle at Al Campo. Well, to begin with, back in July when we were first offered the deal is probably when we should have opened it but then we thought; “let’s wait until we get the contract just in case anything goes wrong; many a slip twixt cup and all that.” So we waited. The contract arrived and we thought; “we’ll sign it and send their copy back and when they receive it, that’s when we’ll crack the cava.” So we waited. For some reason the contract got mislaid in the postal system and it was several weeks before the publisher acknowledged receipt of it, by which time we’d already started drafting the book. So we thought; “OK, we’ll open it when we finish writing the book.” And we waited. We submitted our first draft at the end of October and waited with bated breath to hear if it would be accepted or if it needed more work. Word came quickly that the book was considered “really excellent” by the publisher. Unfortunately, along with the acceptance was a long list of additional things that we needed to produce; a biography, author photos, testimonials etc. so there wasn’t a clear cut ‘finished’ point. We dutifully provided everything on the publisher’s list and then said; ”That’s it. The moment this baby gets to print, the cork’s coming out of that cava before it turns to vinegar.” But then the typeset text arrived for proof-reading, and then the cover, and then finally, we were told it was at the printers. By this time, we’d decided the cava was getting opened on Saturday night and hang the consequences. Unfortunately, we had a ‘difference of opinion’ on the way to watch the match and then, as we only managed a draw, we decided we weren’t really in the mood to drink the stuff. So, as I sit here writing, four and a half months later, the cava is still in its virgin state in the fridge, chilled enough to burn your fingertips at the touch. 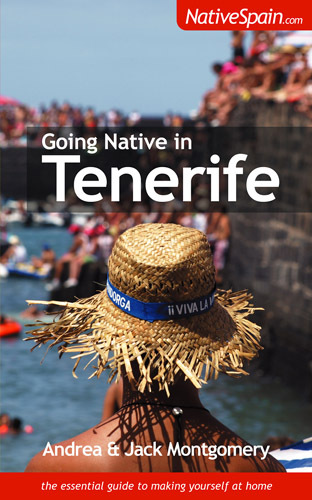 Going Native in Tenerife is now on sale at Amazon.com, Amazon.co.uk and in e book form at Book Shaker.com and as long as nothing untoward happens in the next 5 hours, that damn cava is getting opened tonight. I don’t know what it is about us that drives us to work so hard and yet prevents us from celebrating our successes, something which we both know from our former lives as executives is absolutely paramount to maintaining morale and recognizing good work. It’s time to re-learn some of our management wisdom; from here on in corks are going to pop on cava bottles at the least excuse. It seems that the recent cold (circa 20-22°C) and cloudy weather we’ve been experiencing across the island has forced Tenerife’s ‘fair weather friends’ to show their true colours. Faced with the prospect of a day where they can’t just lie around the pool in their hotel complex, people are actually angry about the lack of sun and threatening to holiday elsewhere in future. Meanwhile, away from the pleasure dome of the south resorts, I went to a Bonsai exhibition in Puerto de la Cruz yesterday. This was two ‘firsts’ for me; I’ve never seen a Bonsai exhibition before and, despite having lived here for over 5 years, have never been to the ex-Convento de Santo Domingo where it was being held. Circling a beautiful traditional Canarian courtyard with its wooden, carved closed balcony, were placed about 50 Bonsai exhibits in exquisite containers. There were formal and informal uprights, slantings and cascades. The perfect symmetry of the branches or the sensuous curves of the trunks were indeed things of beauty. 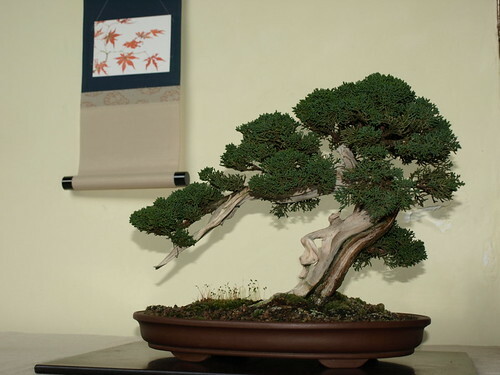 I’ve never really looked at Bonsai trees before and therefore have never really appreciated the skill and patience that must go into their creation. I was amazed at the feeling of wellbeing I got from looking at some of them, as if they were giving off a gentle karma and I found myself grinning like a fool as I worked my way around the courtyard. I left the ex-Convento de Santo Domingo and headed to Casa Ventoso to see the exhibition of belénes (nativity scenes) currently on display there. I was disappointed, if not amused, at the exhibits in the outer courtyard which seemed to consist of a great number of artificial hens and eggs, mannequins draped in plastic robes and toy ducks floating on a pond. But then my eye was caught by several rooms off the courtyard and further exploration revealed a whole series of intricately designed belénes featuring scale models of life in Bethlehem at the birth of Christ. They all had the ubiquitous Wise Men, the angel appearing to shepherds and of course Mary and Joseph and the holy infant in a barn with cattle and a donkey, but they each had their own characteristics of what surrounded the main characters. A desert landscape in which the tiny village of Bethlehem is set and the rhythms of the daily lives of those who live there are carried out in multiple moving parts. But there was something here that I’ve never seen in belénes before. On several of the models, day turned to night and fires and lanterns burned beneath a star studded sky. After a minute or so, daybreak began, accompanied by the sound of a cockerel crowing before once again, the sun rose and life began to stir in the little village. By now, my grin was fixed. 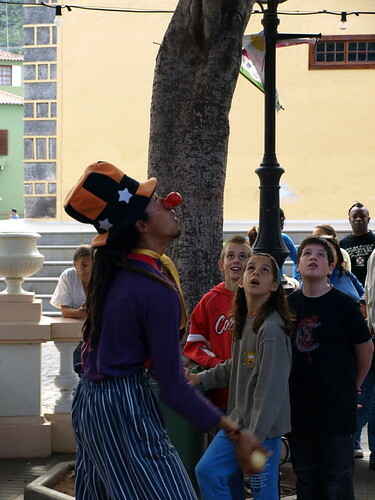 Earlier in the day we’d taken a trip to Los Silos to see their lovely Festival de Los Cuentos, the festival of stories, where we’d watched storytellers and clowns hold groups of youngsters enthralled. There was singing and uni-cycle riding, story telling and juggling, book fairs, jewellery stalls and an assortment of delicious food stalls all set in the beautiful little plaza of this charming village. 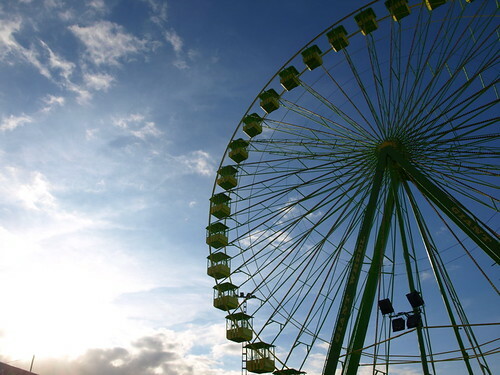 As we walked back through the busy funfair at Puerto where the giant green Ferris wheel was catching the last of the sun’s rays, I found myself hoping that all those who claimed there was nothing to do on Tenerife when the sun didn’t shine would find their Little Britain abroad where the sun shone in a cloudless blue sky for 365 days a year, where the bars had TV sports coverage, where everyone spoke English and lager was €1 a pint and I hoped once they’d found it they would stay there, and leave the real Tenerife to the rest of us. The neon street temperatures may have fallen to 20° C and the sock box may have been retrieved from underneath the bed where it lives for a good eight months of the year, but autumn in the north of Tenerife brings more than adequate compensation for the official end to long summer days. Not least, November brings the year’s new wine harvest, reason enough on its own for a fiesta, but throw in to the mix the happy chronological co-incidence of the celebration of Saint Andrew’s Day (fiesta de San Andrés) and you’ve got all the excuses you need for a very merry affair indeed. On Saturday afternoon we headed up to Icod de los Vinos on Tenerife’s north coast to watch how their youth like to celebrate this time of year. 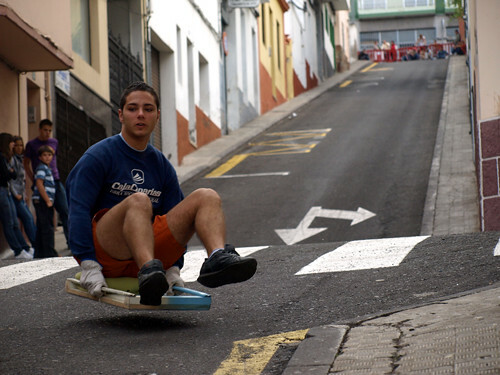 First they take their town’s tradition of rolling wine barrels down its impossibly steep streets on wooden boards pulled by oxen, then they add a little Jackass element and what they come up with is ‘arrastre de las tablas’ or riding the boards. From the top of Calle del Plano (the sort of street that sends a small cramp to the calves at the mere sight of it) teenage lads sit on waxed, wooden trays and career down at breakneck speed, negotiating a small undulation at the halfway mark that bounces the tray off the road’s surface and sends it ever faster towards a heap of old tyres at the bottom of the street. The only brakes are a pile of old tyres; it's like the crash test dummies Tenerife style! 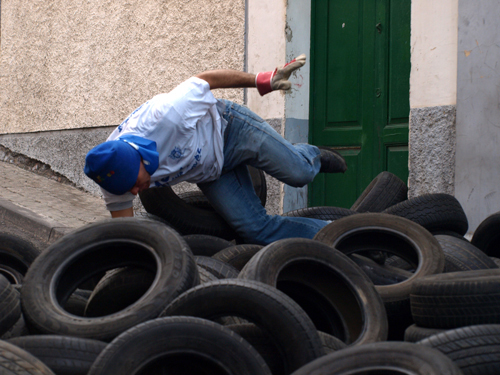 It’s addictively good fun to watch, particularly as the afternoon progresses and the town’s daredevils take to their boards, resolutely refusing to attempt any slow down before smashing into the tyres, travelling several feet into the air and landing in a heap of sprawled limbs amongst the rubber. It’s the sort of event that would have UK and US lawyers rubbing their hands at the prospect of juicy law suits that would lead perfunctorily to a complete ban on the event. Luckily, the Tinerfeños don’t have a litigious bone in their bodies and have never allowed the likelihood of personal injury to get in the way of having a good time. 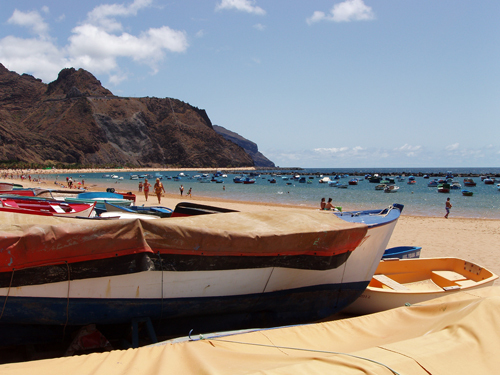 Later, we headed down into Puerto de la Cruz for the rather more sedate, but much more participatory celebrations. In Plaza Charco small children ran across the cobbled surface pulling long strings of empty cans and assorted pieces of metal, providing endless ‘cute’ poses for grinning mums and dads to capture for posterity. 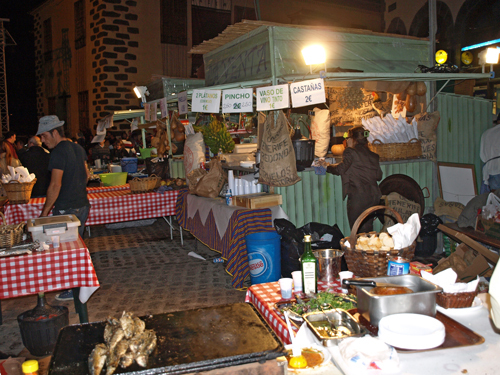 Around the harbour, the air was filled with the fragrant smoke of chestnuts being roasted on open coals, sardines sizzling on grills and succulent pinchos (skewered beef and pork) browning on hot plates as food stalls did a brisk trade with the hundreds of visitors and residents occupying the al fresco tables and chairs. Proving to be extremely popular were the rows of ‘bodega’ stalls where, for 50 cents a time, you could sample any number of excellent wines from local wine producers. It was a difficult choice and I have to admit, the type of ‘nibbles’ that were being offered by each bodega had considerable influence over which stall was favoured by our custom. After half a dozen varieties of both red and white had been tasted and points awarded, I would have had a go on one of Icod’s ‘tablas’ had one been handy. Thankfully for all concerned none was, and we headed off to one of the food stalls for pinchos, crusty bread, spicey mojo sauces and roasted chestnuts to soak up the alcohol. Of course, you can’t have chestnuts without wine and so we ordered a small carafe of the new ‘vino del país‘, or country wine, just to see how it compared with its more upmarket cousins. Fiesta de San Andrés…one of my favourite Tenerife fiestas, hic!